Bump Bump is a Room Escape game from the Japanese site No1Game. Awesome game, but a little confusing. There is only 1 view until the very end. Pick up block of wood. You get a purple box with a time input from the bottom left, need a key and a code and mysterious blocks of wood may or may not help open other drawers. The one you have is useless. Click on the clock: it gives you a hint about AM vs PM. Input the time in military time (15:00) and get a screwdriver. Turn your block of wood over and open it with the screwdriver to get a lever. Use the lever in the yellow bit in the middle, and the room turns! But you seem to have broken your lever, how will you get back? Note the black code on the wall. Now try all the drawers again; different ones are open. The green box is open so you can get the key for the bottom right and get a red code. Bottom right has a blue Bottom middle has a hint paper – you need to add all three codes together for the top-left drawer code (7035). You get a red key. Click the clock again, it has a different hint so input a new time (18:15) for a new lever! Put the lever in the middle. But it doesn’t turn! Use the red key first to unlock it, then you can pull the lever (you need to click the yellow part, not the lever itself, or it will navigate back to the drawers). More things have broken – look closely at the green box and see a black part of a key. We can finally open that left middle drawer for the second part of the key. Use the clock box one last time for the third part of the key (11:45). 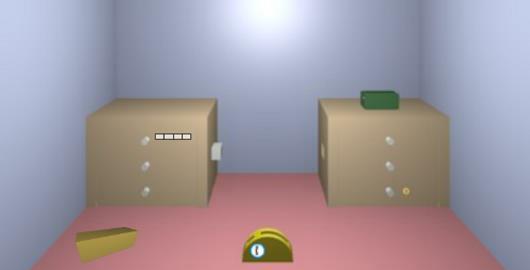 Assemble the key and click on the left side – the pink former ceiling – to navigate to the exit door. Use the key to unlock the code box by the door, then enter the numbers from the key (972) using the buttons underneath, and push the last button. Door opens, you are out! Posted on Sunday, July 27th, 2014. Follow any responses through the RSS 2.0 feed.